In my own journey as an ever evolving artist and musician, I have documented my lessons and turned my gifts into something that I can share with you. More than guitar, I realize that I have taught my students how to write their own songs, the importance of balance, the value in writing, and many other lessons. My students have also taught me how to become a better teacher. Personally and professionally, my students and myself, have benefited from making time and space for music and creative ventures. I welcome middle school through adult aged students! Try a few lessons for a discount! Talk about unprecedented? 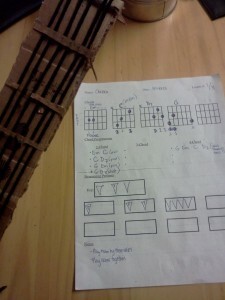 Chelsea, my new student, doesn’t own a guitar yet, but she won’t let that stop her from learning. 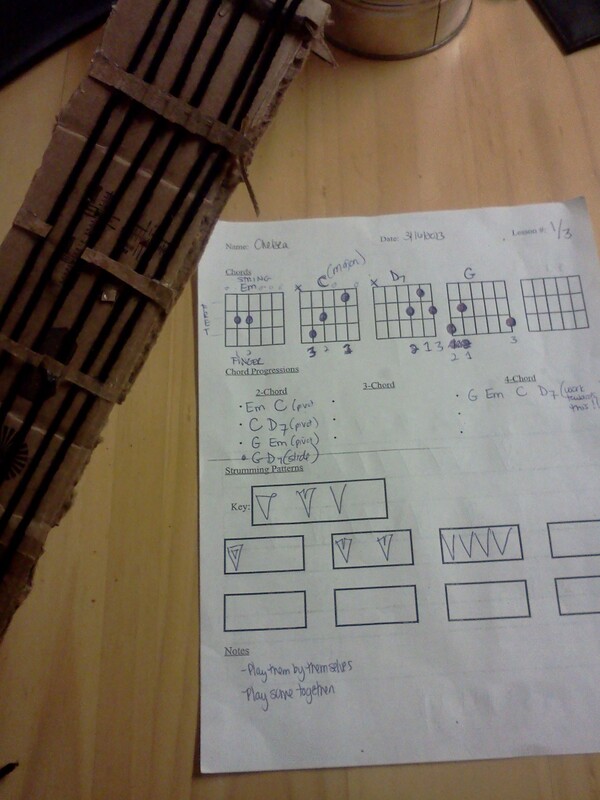 She made a guitar neck out of cardboard and string, so she can practice her finger exercises. Some activities will require supplies and instructor may provide some materials and/or notify class in advance. In your home, office, coffeehouses, art gallery, school, etc. I teach online and “on the ground.” You may also want to do a hybrid course. For these students, we begin meeting in person and transition to online meetings via Skype. Questions about any of it? Please e-mail queenearth@queenearth.com for more information. There will be a discount on booking 12 or more sessions if the classes are confirmed and first payment is received 10 days before the first class of the sessions. ALL classes dates/times and payment schedules must be confirmed in advance via phone. More FAQ/details can be discussed via phone when dates are confirmed. I offer discounts for students, referrals, and group sessions!! The moment I heard Queen Earth’s voice at farmer’s market I had to find her. And to know you’re giving lessons – WOW God Bless you!! Blessed Love and Greetings Sister I will like guitar lessons please contact me when you get a moment peace and love.